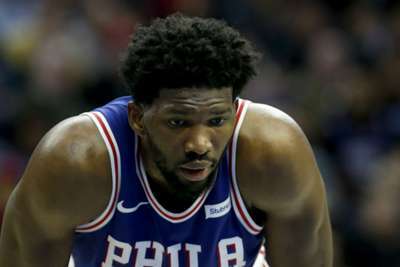 Joel Embiid will not play in the Philadelphia 76ers' first playoff against the Miami Heat on Saturday. The All-Star center sustained a fractured orbital bone when collided with Markelle Fultz on March 28 and missed the remainder of the regular season. Embiid has since been fitted with a protective facemask and practiced with the team on a limited basis, but he will not be used versus the Heat. The Sixers have put no timetable on his return and he has yet to be officially removed from the NBA's concussion protocol. Embiid leads Philadelphia in points (23.2) and rebounds (11.1) per game.